The Private Life of Henry VIII (1933) - it was the first non-US (Hollywood) made film to both earn a Best Picture nomination, and win an Oscar of any sort (Best Actor for Charles Laughton, in this case). Note: Colbert's, Laughton's, Menjou's and Mitchell's performances came at a time when there were 10 Best Picture nominees, while Reilly's was when there were only 5. In recent times since the advent of modern box-office tabulations, Best Director-winning Kathryn Bigelow's The Hurt Locker (2009) was the lowest-grossing Best Picture winner of all time. Its domestic gross earnings were $12.6 million at the time of its nomination, and only $14.7 million at the time of its award. Schindler's List (1993) was the first black-and-white film (although it had a few short segments in color) to win the top award since the all B&W The Apartment (1960). The Artist (2011) was the last entirely B/W film to win Best Picture. The first time all five Best Picture nominees were shot in color was 1956. The first film to be released on home video before winning Best Picture was The Silence of the Lambs (1991). It should be noted that 1956 was the first year that the regular competitive category of Best Foreign Language Film was introduced. Foreign-language films would no longer be recognized with only a Special Achievement Honorary Award or with a Best Picture nomination (as in 1938) - see below. Six films have the double honor of both Best Picture and Best Foreign Language Film nominations: Z (1969), The Emigrants (1972), Life is Beautiful (1998), Crouching Tiger, Hidden Dragon (2000), Amour (2012), and Roma (2018). The Emigrants (1972) was the only one of the five to receive the nominations in different years, and was the only one of the five to not receive the award for Best Foreign-Language Film. Bertolucci's Chinese/Italian-produced Best Picture winner The Last Emperor (1987) was not a Foreign-Language Film nominee. In 1956, the regular competitive Oscar category of Best Foreign Language Film was introduced (the first award was actually presented at the 29th Academy Awards ceremony held in the spring of 1957). Currently, Italy has the most Best Foreign Language Film Oscars - a total of 11 Oscars and 3 Honorary or Special Awards. [Second place is France with 9 Oscars, and Spain with 4 Oscars.] Italy broke its own record for number of Best Foreign Language Film nominations with its 28th for The Great Beauty (2013), the year's winner. Mexico won its first Foreign Language Film Oscar on its 9th nomination, for Roma (2018). If Special Oscars were also considered (awarded before the Best Foreign Language Film category was created), Fellini shares his record of 4 wins with Italian director Vittorio De Sica, who won Special Honorary awards for Shoeshine (1946) (win in 1947) and The Bicycle Thief (1948) (win in 1949), and Oscars for Yesterday, Today, and Tomorrow (1963) (win in 1964), and The Garden of the Finzi-Continis (1970) (win in 1971). There are obvious biases in the selection of Best Picture winners by the Academy. Serious dramas or social-problem films with weighty themes, bio-pictures (inspired by real-life individuals or events), or films with literary pretensions are much more likely to be nominated than "popcorn" movies. Action-adventures, suspense-thrillers, Westerns, and comedies are mostly overlooked (although there are exceptions), as are independent productions. See complete Analysis of Best Picture Genre Biases here. Essentially, there was a tie between the top two 'longest' Best Pictures: the total film time (without music) of Gone With The Wind (1939) at almost 221 minutes (3 hours, 41 minutes), and with the Overture, Intermission, Entr'acte, and Walkout Music, it reached 234 minutes (3 hours, 54 minutes). The total film time (without music) of the "original" Lawrence of Arabia (1962) was just over 222 minutes (3 hours, 42 minutes), slightly longer, while its additional elements extended the film to about 232 minutes (3 hours, 52 minutes). If just counting the film itself, Lawrence of Arabia was the longest of the two contenders. The longest-running Best Picture nominee was Cleopatra (1963) at just over 4 hours. The longest movie to ever win an Academy Award was Russia's War and Peace (1968) at 414 minutes, winner of Best Foreign Language Film. Marty (1955) was the shortest Best Picture winner at 91 minutes (1 hour, 31 minutes), followed by Annie Hall (1977) at 93 minutes. The shortest Best Picture nominee was Mae West's She Done Him Wrong (1933) at 66 minutes. From 1927/28 through the 1950 Academy Awards, the Best Picture nomination went to the production company or studio that produced the film. 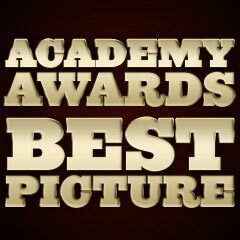 *The only major Hollywood studio never to win a Best Picture Oscar. The first female Best Picture nominee and winner of a Best Picture Oscar was producer Julia Phillips for The Sting (1973). Curiously, in the decade of the 1950s, none of the Best Actress Oscar winners appeared in a Best Picture winning film! Precious (2009) was the first-ever Best Picture nominee to be directed by an African-American filmmaker, Lee Daniels. Quincy Jones was the first African-American to be nominated as producer for a Best Picture nominee, The Color Purple (1985). The second instance was for Best Picture nominee Precious (2009) -- producers for the film included Lee Daniels, Tyler Perry and Oprah Winfrey. Also, African-American Broderick Johnson was co-producer for Best Pic-nominee The Blind Side (2009).